12. NEOTATEA Maguire, Mem. New York Bot. Gard. 23: 161. 1972. Shrubs or small trees with few, thick branches; latex white or rarely transparent; young growth ± hirsute. Leaves spiral, sessile, clustered near branch apices, thick, coriaceous, with numerous, closely parallel, undivided secondary veins alternating with latex canals. Flowers bisexual, apparently axillary, solitary or fasciculate, ca. 3.5-5 cm long. Sepals 5, quincuncial, hirsute or not; petals 5, contorted. Stamens many; filaments long, free; anthers long, with a large apical gland. Ovary 3-carpellate, placentation axile to subparietal, ovules many per carpel; styles fused, short; stigma expanded. Capsules septicidal. Seeds linear, ± winged, papillate; cotyledons small. Endemic to the Guayana Shield in Colombia, Venezuela, and probably Brazil (Serra da Neblina); 4 species, 3 in Venezuela, all in the flora area. Although Neotatea clearly belongs in the Clusiaceae (A. L. Weitzman and P. F. Stevens. BioLlania Edición Especial 6: 551-564. 1997), it was placed by Maguire (Mem. New York Bot. Gard. 23: 131-165. 1972) in the Bonnetiaceae and by Cronquist (An Integrated System of Classification of Flowering Plants. Colombia University Press, New York, 1262 pp. 1981) in the Theaceae, but Neotatea has latex, which is uncharacteristic of these families. Furthermore, the leaves of Neotatea are pubescent, a character otherwise unknown in Bonnetiaceae (or Bonnetioideae or Theaceae). Steyermark (Ann. Missouri Bot. Gard. 71: 297-340. 1984) placed Neotatea in Bonnetia, but he later acknowledged this was a mistake (O. Huber, personal communication). The only species of Neotatea not in the flora area, Neotatea colombiana Maguire, is known from Cerro Isibukuri and Cerro Monachí, in Vaupés, Colombia, where it is the dominant summit species. It is a tree 1-7 m tall with white or resin-like latex, asymmetrical leaves with retuse apices, lateral veins diverging from midrib at an angle of ca. 45°, glabrous (rather than hirsute) sepals, and rose to violet corollas. Neotatea duidae (Kobuski & Steyerm.) P.F. Stevens & A.L. Weitzman, BioLlania Edición Especiál 6: 559. 1997. -Bonnetia duidae Kobuski & Steyerm., J. Arnold Arbor. 29: 411. 1948. -Neogleasonia duidae (Kobuski & Steyerm.) Maguire, Mem. New York Bot. Gard. 23: 160. 1972. Shrub or small tree 1-3 m tall; latex white; petals deep rose or reddish to violet. Dry ridge tops, low hills, canyon edges, 1600-2100 m; Amazonas (Cerro Duida). Endemic. 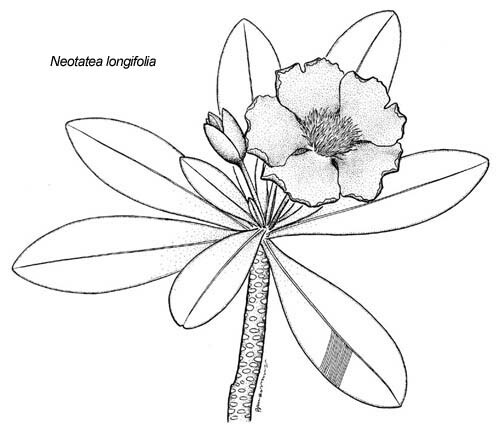 Neotatea duidae was placed by Maguire in Neogleasonia and by Kobuski and Steyermark in Bonnetia. However, unlike Bonnetia, this species is pubescent and has the long anthers (ca. 5 mm long) of Neotatea (see also Weitzman and Stevens 1997). Neotatea longifolia (Gleason) Maguire, Mem. New York Bot. Gard. 23: 163. 1972. -Bonnetia longifolia Gleason, Bull. Torrey Club 58: 396. 1931. Shrub or small tree 0.1-15 m tall; latex white, rarely transparent; petals pink, rose, or violet. Tepui-summit savannas, sparse shrublands, 800-2000 m; Amazonas (Cerro Duida, Cerro Marahuaka, Cerro Parú). Endemic. Fig. 222. This is the most widespread of the four species of Neotatea. Neotatea neblinae Maguire, Mem. New York Bot. Gard. 23: 163. 1972. -Bonnetia neblinensis Steyerm., Ann. Missouri Bot. Gard. 71: 330. 1984, non Bonnetia neblinae Maguire 1972. Shrub or tree to 2-12 m tall; latex white, rarely yellow; petals pink or purple. Around exposed sandstone outcrops, scrub vegetation on exposed, often steep, rocky slopes, 400-2000 m; Amazonas (Cerro Aracamuni, Sierra de la Neblina). Endemic.